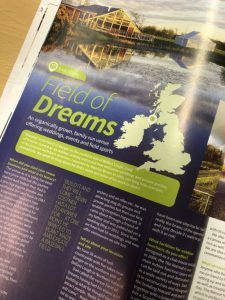 Flicking through this month’s Open Air Business, the outdoor hospitality magazine, we stumbled onto an article about Field of Dreams. Located in Bangor, Northern Ireland, Field of Dreams is a shooting and field sports venue named after the Kevin Costner hit movie. The article explains how in the early 1990’s the venues owner, a pro clay pigeon shooter, wanted to use the land to offer field sports. He soon created areas for clay pigeon shooting, air rifle shooting and archery, before diversifying further into weddings and glamping. Could a venue that offered target and field sports could diversify into weddings and glamping? Do you have the space to spare to offer target and field sports? Not only will you need to consider the space to do the activity, but the overshoot area needs to be considered as well. This varies with each activity, but an archery range without backstop netting required 120m of empty space beyond the target, while clay pigeon shooting needs 250m. Don’t have the room? Think about activities like laser clay shooting or axe throwing which have smaller over shoot areas. For most target and field sports no additional planning permissions will be required, however if you are considering clay pigeon shooting there are some considerations. Firstly, to allow non-licenced individuals to shoot you will require a Section 11(6) exemption from the Firearms Act. These are available from your local police Firearms unit. Also, without full planning permission you will only be able to shoot 28 times a year. You are amazing at running your venue, but how’s your axe throwing instructional skills? While some target and field sports can be delivered to your guests with little or no training other will need qualifications and/or experience. PreviousPrevious post:Laser Tag – We’re a little excited! Has the snow gone yet?